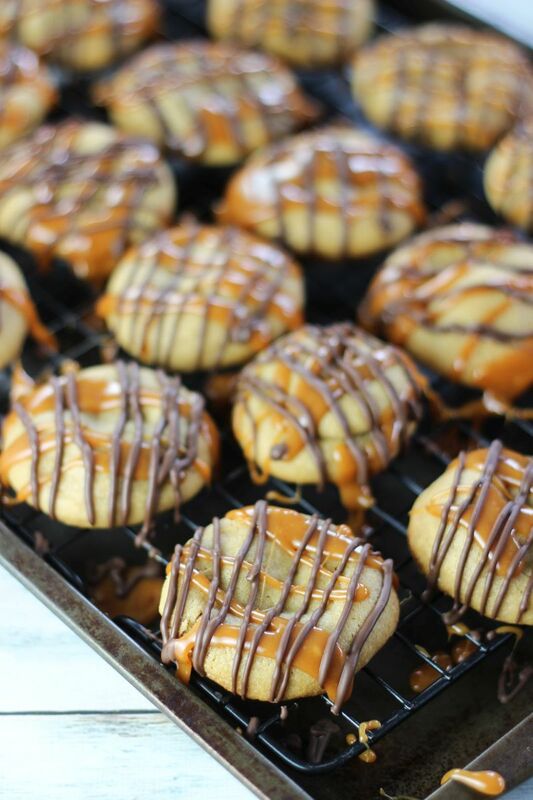 Soft peanut butter cookies stuffed with a mini Snickers bar, and drizzled with caramel and chocolate! 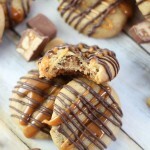 Ultimate candy bar cookies! As I mentioned a few times leading up to it, my Grandma’s 90th birthday party was last weekend. The big 9-0. She was veeeeery excited for it, as you might guess a person turning 90 would be. As birthday cards arrived during the course of the week, she’d say, “Who wants to be reminded that they’re turning 90?” Ha! Noooooooooooooooooo, Gma, of course not. No big deal. We made a big deal. When my Gma was a kid, her family spent a lot of Sundays driving to Cook Forest in central Pennsylvania after church. They’d picnic, and spend the day hiking in the woods, and playing down at the river. It had been about a decade since her last trip to one of her favorite childhood places, a place she’d told many fond stories about over the years, and so we packed up what seemed like a million coolers full of mayonnaise-drenched foods for a big family picnic at Cook Forest. The weather was completely perfect, the drive is scenic, and the park itself is beautiful. There was lots of family fun to be had, and my Gma was truly in all her glory the entire day. She also received many a gift with kittens on it, as to be expected. My Grandma’s favorite candy bar is Snickers. Whenever I see one, I think of her. The fact that these cookies have Snickers bars stuffed into the middle of them is the only real tie-in to me talking about her birthday party. Oh well. 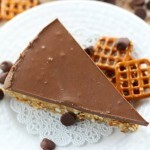 I have already shared most of her favorite recipes, so this slim connection will have to suffice for today! 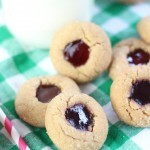 I’ve been making these occasionally for over 10 years now, and these cookies never disappoint. How could they? 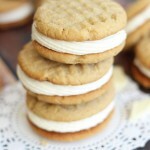 They have a candy bar in the middle of them and are made with lots of peanut butter. Best cookie ever. They were called Santa Surprises (???) in the book where I found them, but I don’t see how these have anything to do with Christmas at all. So here we are. 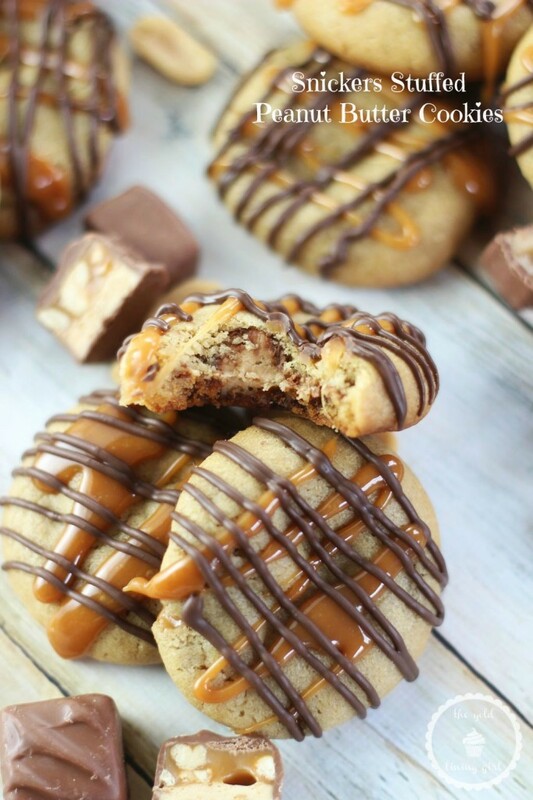 Snickers Stuffed Peanut Butter Cookies in August. 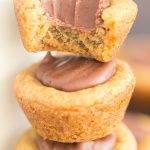 These are a soft peanut butter cookie with an ooey-gooey center from a very melty mini Snickers bar. 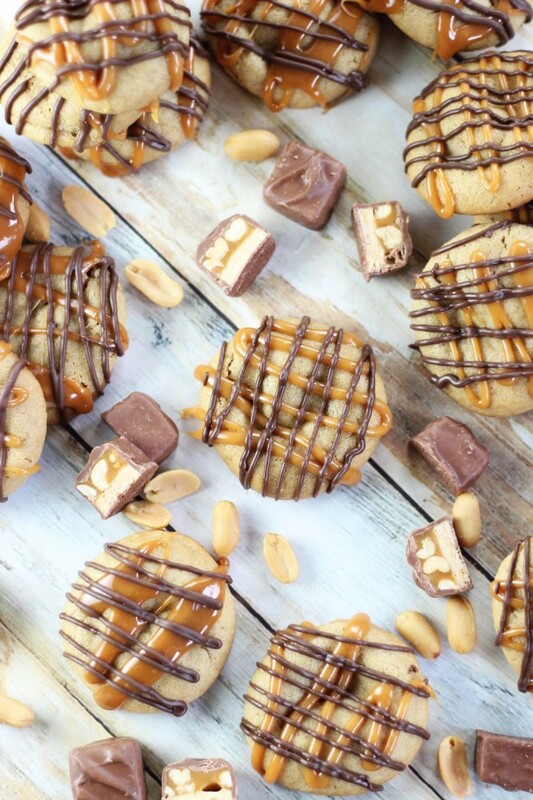 Caramel, peanuts, nougat, chocolate, and peanut butter all combine in one amazingly decadent cookie, finished off with drizzles of caramel and chocolate. 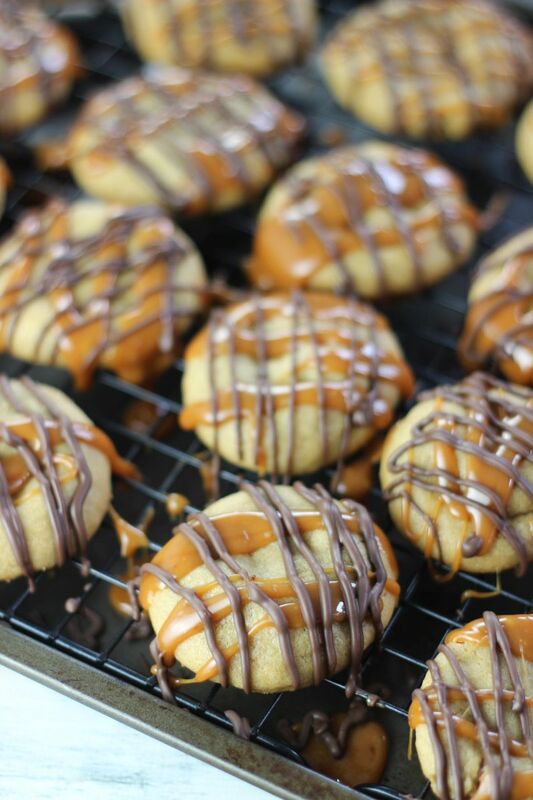 Peanut butter cookies stuffed with a mini Snickers bar, and drizzled with caramel and chocolate. 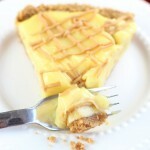 In a large mixing bowl, combine butter, peanut butter, brown sugar, and sugar. Add eggs and vanilla, beating until thoroughly combined. In a separate large bowl, combine flour, baking soda, and salt. Add flour mixture to mixing bowl, and beat until combined. Cover and chill dough for 2-3 hours. Scoop dough 1 tablespoon at a time, press it flat into a disc, place a Snickers mini in the center, and wrap the dough around it, covering all the edges. Roll it into a smooth ball. Place on greased cookie sheets about 2 inches apart. Bake at 325 degrees for 13-15 minutes, or until edges are golden brown. Let cookies cool on baking sheet. Heat the caramels and cream in a microwave-safe bowl at 30-second intervals until melted and smooth. 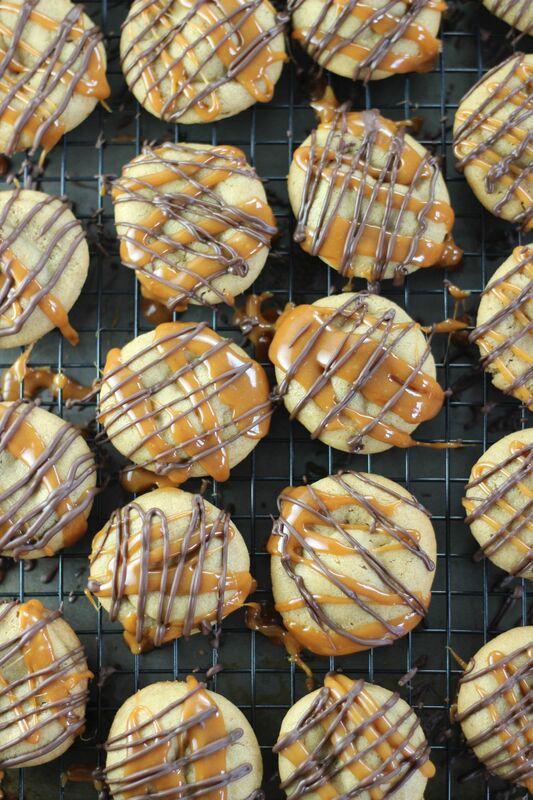 Using a spoon, drizzle the caramel over the cookies. Heat the chocolate chips in a microwave-safe bowl at 15-second intervals until melted and smooth. 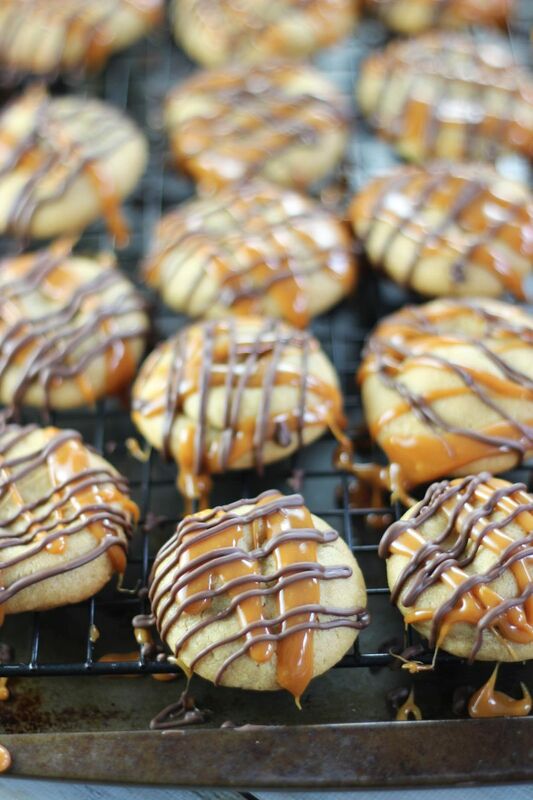 Using a spoon, drizzle the chocolate over the cookies. Have you noticed that I’m on a publishing roll this week??! My grandfather’s Navathi, or 90th birthday, was last year! We also made a big deal, inviting alllll his friends and family 🙂 These cookies look delicious! 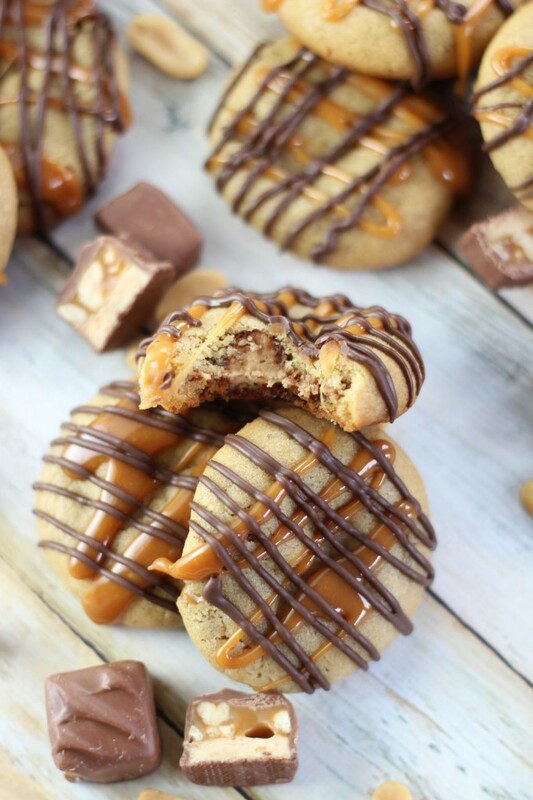 Loooove that they’re stuffed w snickers and the drizzles on top look to die for 🙂 Pinning! You’ve been there? How cool! It’s beautiful there. Thank you so much, Beverly! Sweet! Thanks so much, Kyla! That’s awesome news! OMG! My favorite candy bar and my favorite cookie together!! I can’t wait to try this recipe. It would be hard for me to make sure the snickers make it into the cookies instead of straight into me. I know, right? I love Snickers! Thank you so much, Audrey! I love that your grandma said “Who wants to be reminded that they’re turning 90?” It is so true! I don’t even want to be reminded of my age now! lol Anyway, these cookies look delicious! I can’t wait to try them! My favorite quality of hers is that she has never lost her sense of humor! My Gma has one of the best senses of humor, and she says quippy things like that a lot. Cute, huh? Thanks so much for your kind comment! Good morning Sarah, I can see your cookies are Very popular and I wanted to stop by and let you know that you are being featured. Hope you have a beautiful week!! Oh, great! That’s wonderful news. Thanks so much for the feature, Karren! JUST FOUND THIS!! Omg what a beautiful cookie. And…of course…Snickers is my favorite candy bar also. 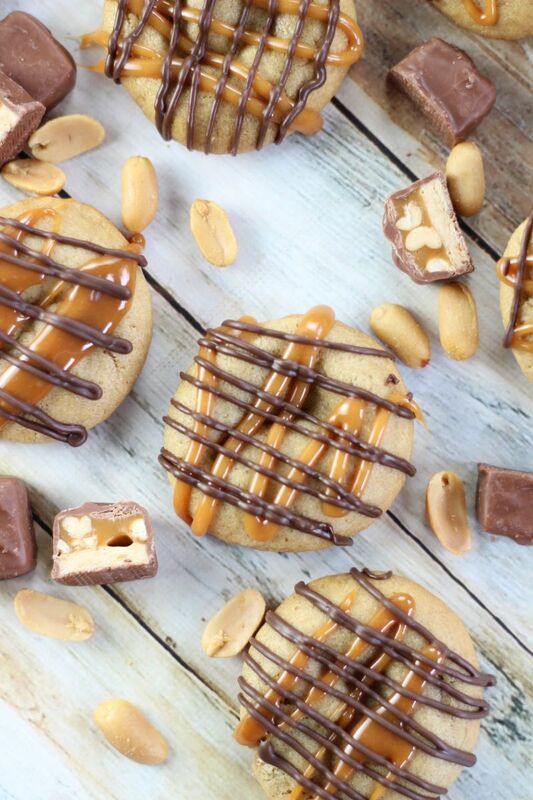 Who can turn down a peanut butter cookie? I can’t WAIT to make your brilliant cookies. A thousand Thank Yous! !